I am afraid that I have a confession, when I was in Year 3 I was sent to Handwriting Club because my handwriting left teachers in despair! There I met an extraordinary teacher who introduced me to calligraphy and taught me the importance of handwriting and what it says about the person behind the pen…this could well have been the start of my artistic career as I have loved looking at handwriting ever since. Today, Josh Holloway joined me to show the journey that he has been on as he has learned to express himself through the power of the pen. 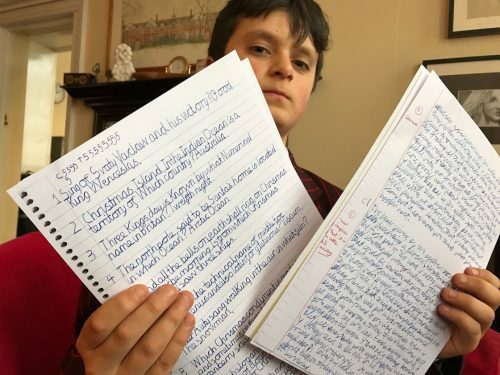 His handwriting is stunning and in the digital age, it will stand out from others when his letter arrives on the desk of a future employer! We are learning the cost of iPads in the development of hand-eye coordination and therefore this genuinely made my day…well done Josh…this is a lifeskill that pays dividends!